"The environment reaches out to all kinds of people, young and old, and across political boundaries. It is a natural Conservative issue. David [Cameron] would score a really big hit by saying it would be right at the centre of his policy-making and the Tory party's next election manifesto. It would be another way of showing this is a different Tory party. It would show we have turned our back on the last eight years. We can capture moral policy and international leadership on it." Mr Cameron has become an enthusiastic supporter of the Kyoto approach to global warming - just as Tony Blair has cooled towards it. "The era of cheap flights to the Mediterranean is going to coming to an end. It is unsustainable. Of course, people don't want it. It is going to put up the price of flying. But equally, if we don't tackle aviation, we will have no credibility at all on climate change." A post on the Commentators blog argues that scarce resources would be better devoted to other sources of global injustice. DC would be well advised to steer clear of this sort of gesture politics, as it is a lose-lose situation. He will find it impossible to get the agreement of other nations, and unilateral costs on to our economy would do us damage, without making any inroads into global warming. If we are to engage the new generation of politically active citizens, be they lobbyists, journalists or politicians, we need a good policy on environment and we need we need people to know that we have one! I much admire Tim Yeo for pushing at least the second part of that. All power to him! Tim Yeo is suprisingly right. The environment is THE issue for the next century and if we all adopt the policy "I'm not doing anything until they do", that's as far as we'll get. Debate about economic impact, Kyoto and technology solutions is all very well, but invariably we use it as an excuse to do nothing now. Industry accounts for only 25% of British energy consumption. Clearly we can work on reducing the other 75% without harming industry. Yes, we need to talk seriously about the environment. No, we don't need more Kyoto. It's funny how Yeo, when talking about this, says "It would be another way of showing this is a different Tory party." Doesn't this trumpet to the whole world that it's all about gesture and not about dealing with the problem? We should talk about the issue, not about how talking about the issue makes us look good! Great idea ! Trade sanctions and import controls on Chinese goods unless they meet EU Directives on recycling and environment. Refusal of Government Ministers to travel in any limousine not meeting the latest environmental standards. Refusal to fly in anything but the most fuel-efficient aircraft. House of Commons energy bills to be capped. Massive expansion of nuclear power stations. Tim Yeo has found an exciting and challenging programme to enthuse everybody, but noone believes it is anything more than a slogan. Exactly,Rick, this will only lead to us being perceived to be just like Blair - all talk and very little action. If you choose to fight a battle, make sure it's one you can win. To deliver the sort of world-wide emission cuts that would have any chance of success is impossible. Home grown cuts would only be a gesture, and could cost a huge amount. Just imagine the cost of insulating all homes to modern standards; raising fuel duty to a level that drove people out of their cars, and cut air miles significantly, etc. Of course we can only imagine it because no government would do it in a democracy. Derek, "world-wide emission cuts that would have any chance of success is impossible" is the defeatism that makes success impossible. Britain shouldn't be running with the pack. We should be at the forefront of this essential area of policy and research. "the frontrunner to become an international and moral leader on climate change"
This is the key sentence. And yes, yes, yes you should do it Cam. It is a major issue and people are concerned, they are fed up with Bush siding with big business interests over the environment. The last thing the publ;ic want is an apologist for big business, who want do what is necessary because trade may be damaged in the short term. I don't disagree with the Kyoto critics on this blog, but Kyoto is step one and we need to be commited to it and then push to bring in other nations and use of new technology to evolve from Kyoto. 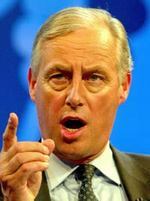 Tim Yeo is spot on, it is a chance to out-flank Labour on an issue that has been the staple of the left for too long. "who want do what is necessary"
sorry, should read "who won't do what is necessary"
too early on a Sunday for me. The environment as for far too long been monopolised by the left. We Conservatives should be the ones fighting to conserve all that is best in the environment. I welcome David Cameron`s commitments and I am sure that once he is elcted he will fight back and make people realise this issue is as important to us as it should be to everyone. Jack: "The environment [h]as for far too long been monopolised by the left. We Conservatives should be the ones fighting to conserve all that is best in the environment." I agree but we shouldn't be using left-wing tools like Kyoto. Ed, yes we should, if we're trying out out-Labour Labour. I mean, we are the very stupid party. We've been beaten by Labour so badly that we now want to be like them. So we embrace the territory just as they leave it. More Kyoto! More quangos! More taxes! (ie Yeo's proposed tax on the poor old workers for wanting to take a cheap break on the med). I don't think we really need to worry about living in a Kyoto-hobbled Britain. There's no way any power-seeking politico would actually implement any of the difficult stuff. "they are fed up with Bush siding with big business interests over the environment"
Really ? He is right and Europe is wrong. What good has it done Britain to close down coal-fired power stations - Germany has them still burning lignite which is subsidised ! The US generates 30% global GDP - without the US trade deficit the global economy would collapse. The EU has a stagnant, dying economy which can neither employ millions of school-leavers (1 million unemployed aged <25 in Germany - and the new Govt aims to cut the pay of Army conscripts !) nor can it fund the welfare states they have built; but they have lots of windmills, recycle waste food, and send PET bottles to China for recycling. If this continues Europeans will be depending on economic aid and food parcels from China in 20 years time because the costs of the welfare state are unsustainable with Europe's pitiful economic growth. Germany has negative domestic growth and only survives by exporting to the USA. Jack Stone, you are unreal. If you want to play this environmental stunt then kill the livestock in the country - that is a big source of CO2. Ban all housebuilding, ban the use of PVC windows, start a policy of subdividing all larger houses into condos for multiple dwelling units; and restrict use of the Internet (this is driving electricity consumption upwards). Really change society and close down all internal air flights in Britain. Ban all cars from London and restrict temperatures in all homes and offices, ban air-conditioners, and ban out of town shopping centres and break up the supermarkets. The fact is you do not have any idea what is involved in the gibberish uttered by Tim Yeo. In 1973 we had an energy crisis and plans for rationing were introduced; look back at them and decide how you would sell that message - Heath failed - Germany banned driving on Sundays back then. Rick, your mocking posts are absurd and ridiculous. I wonder how it's possible to get anything done with people like you in our society. "I welcome David Cameron`s commitments..."
To establish a publicly-funded, unelected, unaccountable quango? Rejoice! Rejoice! The world has been saved from the threat of climate change! And would you believe it, by a man who has used air transport throughout his leadership campaign?! Cameron truly is a friend of the earth! a philosophical device which politicians implement. Yeo is full of wind...........in June 2006 an EU Directive comes into force on recycling of batteries and electronic goods - does any shopkeeper know this ? It will be just like the Directive on recycling refrigerators which led to them being stacked up in Manchester. It is airheads like Yeo and Meacher that are too busy listening to their own braying that nothing gets done. I am frankly tired of listening to the rubbish spouted on the environment by half-wits who talk and talk and do not deal with simple tasks. Maybe you Mark Fulford are just as useless, I don't know; but I work in a world where I want action on existing agreements not platitudinous dinner-table conversation to make the gabbling politician look like he is able to converse with his teenage mistress about whatever appears on a milk carton. It is time people like Yeo and Meacher did something rather than look for some flag to wave.